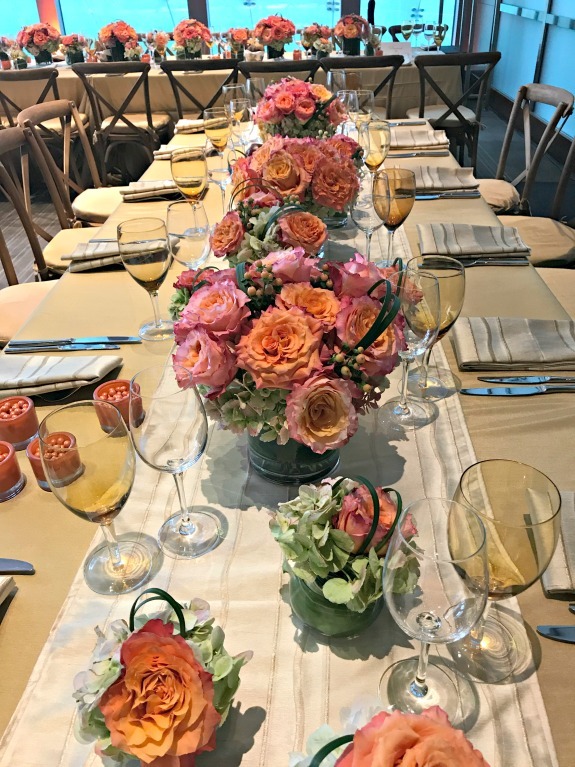 Yesterday I had the pleasure of attending my company’s annual New York luncheon. It was held this year at the beautiful Conrad Hotel in lower Manhattan. I had to throw in the lower Manhattan part because driving downtown is probably my least favorite thing to do. We won’t talk about how long it took me to get there during rush hour (well over 2 hours) or how long it took me to get home (another 2 hours). Or that I ended up on the Brooklyn Bridge when I didn’t mean to end up on the Brooklyn Bridge and had to go over the bridge only to turn around to come back. Once you get down to lower Manhattan though (I’m talking down by the World Trader Center/Freedom Tower area) it’s really beautiful. Anyway. Let’s talk about the food! While I handle writing and content for AllSeated, my role at our events typically involves social media. This means taking pictures of the food is actually considered normal and appropriate! I missed pictures during the cocktail hour but I did eat a mini grilled cheese. 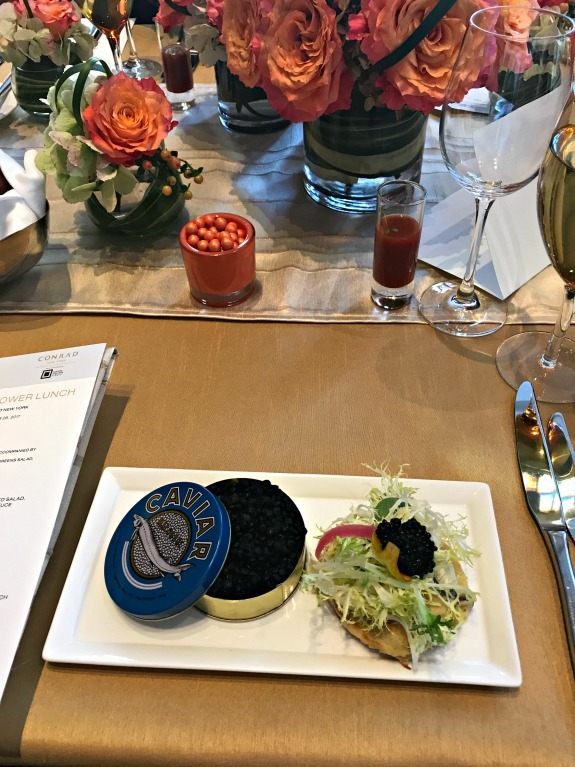 With a quick picture of the menu, you can see that the first course was caviar and the main course was a smoked salmon dish. They went with a super cool and trendy “boozy brunch” menu concept (Bloody Mary shooters at each place setting!) but my taste buds were not exactly thrilled. Of course I can appreciate a fine menu and trust me, the food was of highest quality and delicious. However, you need to actually like caviar and smoked salmon to fully enjoy it. I did my best to not be my former picky eater self. I tried everything, found the parts that I liked but didn’t touch the caviar. I’m still not ready for caviar. 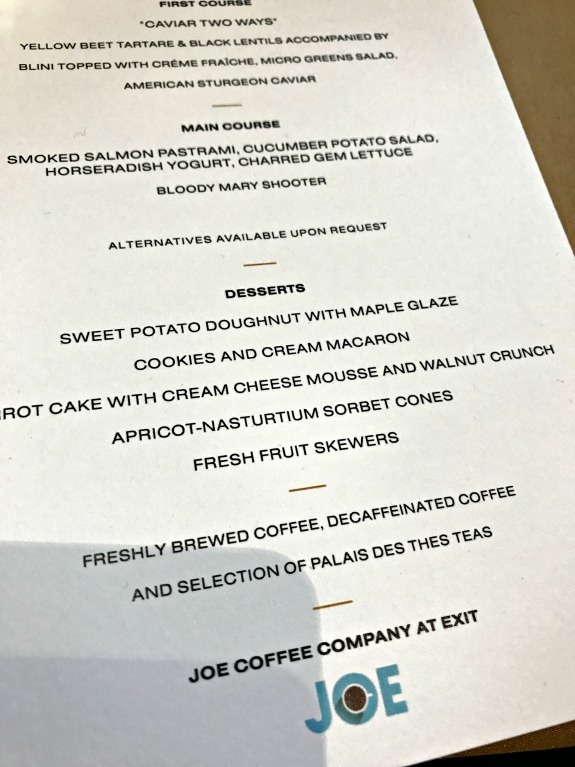 While there was an option for a vegetarian menu, I was honestly too busy at the event to ask for it. The bread basket is always my friend though! 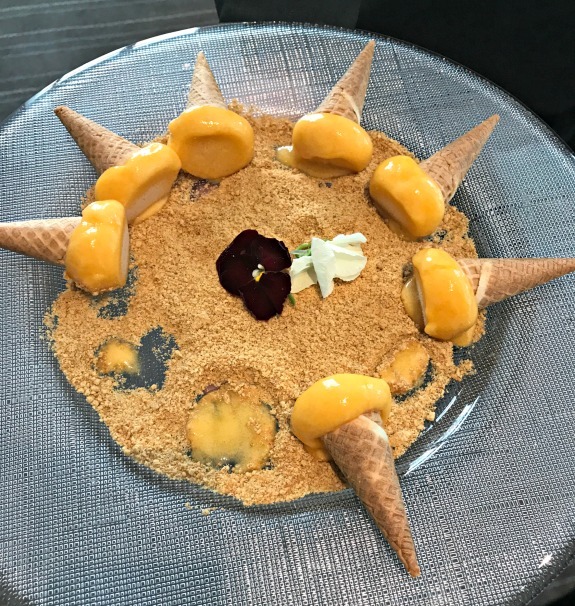 Dessert was great which we know is my favorite part anyway. 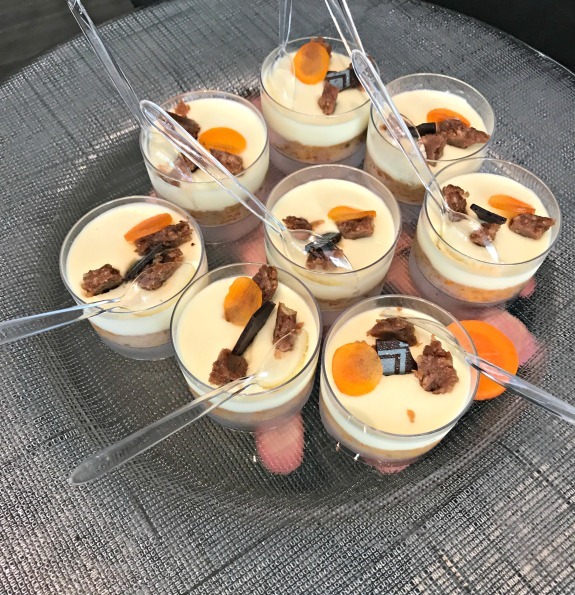 I had one of these mini carrot cake cheesecake things and really liked it even though it didn’t involve chocolate. And sweet potato donuts! I can’t really say that the donuts specifically tasted like sweet potatoes but they were delicious. 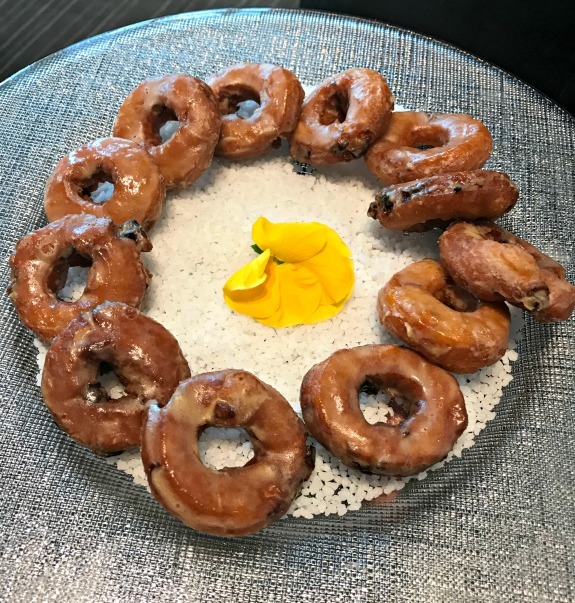 The maple glaze really tied it all together. I didn’t have one of these cute little sorbet cones but took the picture for us. Dina and I realized after the fact that we don’t think we took our usual team photo or even a picture together! If I find one today from the photographer images, I will share it in a later post just in case you care to see what I looked like at the event. 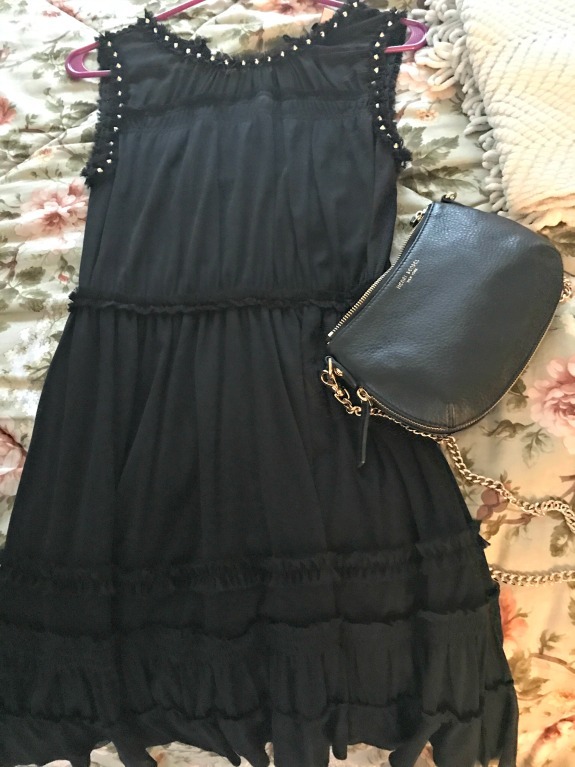 I had actually bought two new fall outfits to choose from for the luncheon but the weather has been SO WARM here that I ended up wearing my all-time favorite, always perfect black Juicy Couture dress. I once shared a picture of me in this dress, it’s in this post – I honestly looked the same yesterday and even wore the same shoes. I’m hoping to go back to try the Conrad Hotel’s rooftop bar and restaurant. I was speaking with the marketing manager and she was telling me all about their seasonal menus which sounded really delicious and interesting. I will keep you posted! Thanks to Laura for today’s What I Ate Wednesday link up fun! Ever tried a sweet potato donut? Way to go on trying everything! As a picky eater, I don’t know if I would have been able to. I’ve never heard of a sweet potato donut. I think my favorite is a warm Krispy Kreme. 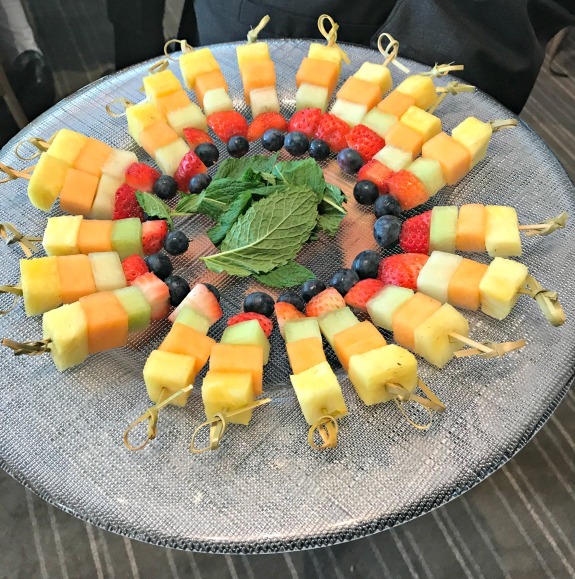 I Love events focused around food! Everything looks amazing. And I’ve honestly never tried cavier before, I’m not too picky of an eater so I think I would enjoy it. I absolutely love going to these events for the food! Looks like a fabulous luncheon! I’ve never tried a sweet potato donut but boy do I want to now. I love sweet potato anything! I love smoked salmon but I am pretty neutral on caviar. I’ll eat it if it is on an appetizer that looks good, but I don’t seek it out. Those donuts look so good! My current favorite is an apple fritter, but I also really like chocolate or maple glazed. I am forever a chocolate donut fan (glazed or chocolate creme filled) but this sweet potato donut with maple glaze was so good! I would have had a hard time with that menu too, but at least the apps, bread basket, and dessert sounded good! 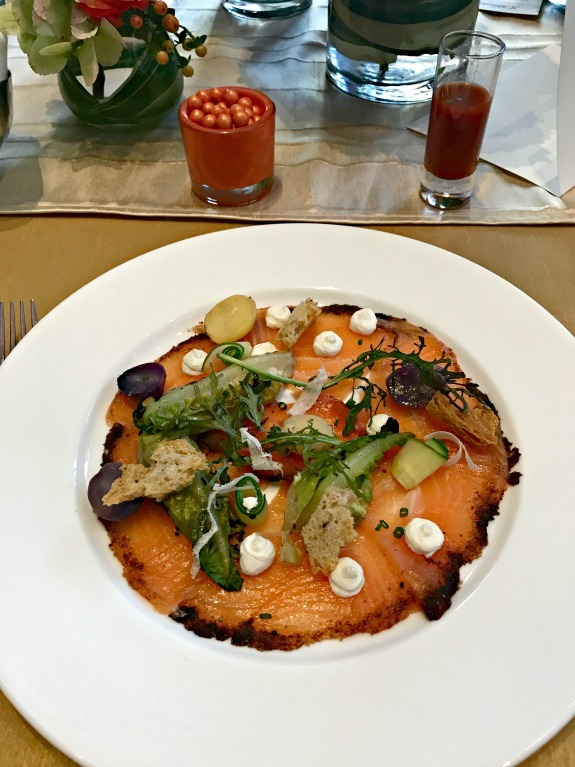 I felt bad because the food was truly of highest quality and so beautifully served – I’m just so picky sometimes! I would have been all over those desserts and the Bloody Mary shooter.